The Federal Reserve continues QE Infinity on its quest to unwittingly destroy the dollar and the financial lives of Americans for generations to come. They persist in the misguided belief they can control economic recovery by printing money. Or maybe in the misguided belief that they aren't printing money, but simply investing wisely. It is astonishing to think that this current round of QE has been greater than the first QE after the financial crisis of 2008. While not robust, the economy is clearly better than it was then. But the wizards at the Fed keep blowing this bubble to float the economy. When it it pops, this one is going to make a real mess. An economy can't be pushed (bubble) into doing something it won't naturally do without returning (pop) all by itself to some stable level eventually. Unfortunately, when bubbles pop, they overcorrect to the negative before things can stabilize. Here's a look at the S&P 500 over time. You can see the bubbles easily here. The Internet, while not created artificially, was a bubble. As such, it was not sustainable over the long term and popped, albeit gently as a natural bubble is wont to do. Once people figured out what they could and couldn't do with the Internet, things got back to normal. Unfortunately for us, the soap of the housing bubble had been wetted, and it began to grow. This government-created bubble ended with its pop as all eventually do. So the Fed decided to create a third bubble. What do you suppose will happen this time? Could it be that this time it's different? 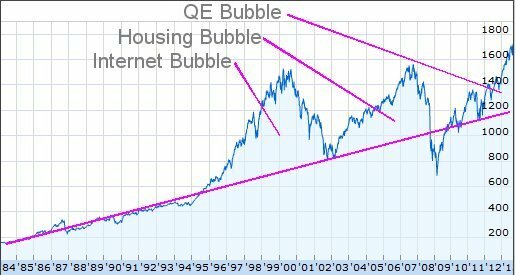 If reviewing the past can anticipate the future, then the trend line shown tells the story of where we might have been had the government and the Federal Reserve left things alone. Regardless of whether this regression line is exactly correct, the trend of the current recovery is clearly not sustainable by any logic. Today's Fed action to continue QE is just more foolishness. QE didn't help us recover from the great depression; even then Treasury Secretary Morgenthau was quoted after years of money printing as having said, “I say after eight years of this Administration we have just as much unemployment as when we started. … And an enormous debt to boot!” He wasn't kidding. There are only two ways to "unwind" the actions of the Federal Reserve's latest money printing efforts. 1) If they can sell all these unwanted assets at the same or higher price, then it's not money printing at all, but just a wise investment. Unfortunately, I know of no pundit, not even at the Fed, confident in that possibility. 2) The taxpayer is on the hook for the trillions of dollars of falsely printed Federal debt. If option two is the only real possibility, we know there are only three ways to reduce debt: taxes, borrowing and inflation. Taxes and real borrowing are valid, but these are unrealistic because the amounts ($17 trillion and counting) are so huge. Thus, inflation will be the biggest part of the solution. After significant inflation, all dollars are going to be worth less than they are today and a trillion dollars won't be as big of a problem as it is today. The Fed's math simply doesn't work and our children will eventually pay for it with inflation. Sadly, inflation hurts the poor more than it does the wealthy, but this is where our country is headed.